Explore our summer exhibit to uncover fascinating facts about who actually lives in trees, what kinds of animal clues to look and listen for in the forest, and how people use trees for their homes. 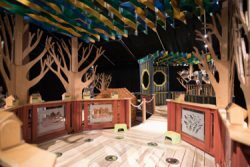 Experience the joyful spirit of childhood tree houses – playing inside the tree houses is encouraged! You can also stomp on the Forest Sound Dance Floor to make woodpecker tapping sounds and turkey gobbles, turn a tree into a house—and back again—with the Spin Browser, and learn about sustainable logging. Be sure to also check your animal tracking skills as you hunt for signs left by bear, raccoon and skunk or don an animal costume for imaginative play time! Developed by EEC! Funded by Jane's Trust, Cabot Family Charitable Trust & IMLS. Locally sponsored by the City of Sugar Land – Visit Sugar Land.